Six houses, five apartments, three motels, a Hollywood mansion, and a small vegetable farm in Pennsylvania. Experiencing the early life of self-taught artist, writer, and drummer, Carol Es was enough to confuse any kid. Carol grew up believing she was inherently bad; she'd suffered psychological abuse of her mentally ill mother, an unstable family that moved around a dozen times before her ninth birthday, and endured horrific sexual molestation. By the age of 15, she felt compelled to ditch a rootless, dysfunctional family circus and head out on her own. From there, she wound up trapped in a cult for the next 20 years. Seduced by the celebrity that lured her into Scientology and their magic promises to fix her broken life, Carol buried herself in the concepts and philosophies of L. Ron Hubbard. Meanwhile, she hopelessly denied and hid her own underlying mental illness which went on untreated because of her belief in a doctrine that made psychiatry out to be an evil hoax. Throughout suppressing the pain she was living through, and that of her past, she somehow remained truly bonded to art and music as a means of survival. 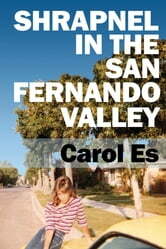 After a tumultuous childhood and years of mind control, Carol has taken a huge stride out of the blackness of fear and silence by completing her book, Shrapnel in the San Fernando Valley—where she shares an unexpected perspective through moments of true vulnerability, gallows humor, and genuine honesty. Illustrated with original sketches throughout, she invites the reader into her confidence, laying bare her most raw and intimate revelations as an artist and a woman finding self-worth, something she had to build upon with only a fragile foundation. It is a courageous, relatable story that will keep you turning the pages. Carol Es has earned many honors during her career in the arts, including a Pollock-Krasner and the Wynn Newhouse award. Her work can be found in the Getty Museum, the National Museum of Women in the Arts, and MOMA. As a musician, she has worked with renowned producers, recorded with artists such as Rickie Lee Jones, and has toured North America. She lives in Los Angeles, where she enjoys studying cultural anthropology and spending time with her partner and their little gray dog. For more info, visit Carol's blog at esart.com/blog.